If you want to beef up your tuxedo suit jacket collection the right way. Tazio is the label that you need to consider first. That is because Tazio specializes in fine Italian style tuxedo suit jackets that are designed in Italy and made of fine fabrics. 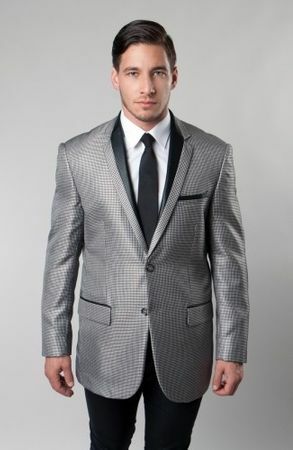 This black and gray houndstooth tuxedo suit jacket features a slim style fit and features a black trim chesterfield style collar and trimmed pockets for a great look.